Nashwa Al Ruwaini is a prominent and highly recognized Arab business woman who has vast experience in the media field and a career history that has led to her being acknowledged over the years as a best-in-class leading media and business excellence personality. 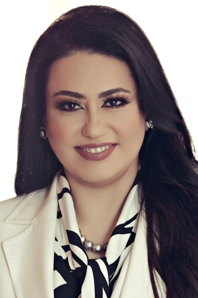 In terms of her business achievements she is currently Board Member and CEO of Pyramedia – Media Production and Consultancy, CEO of Al Joude Investments, CEO of Al Joude Advertising and Publicity, as well as CEO of Delma Medical Centre and Founder of Nashwa Jewellery, an exclusive pearl collection and Al Majlis restaurant and cafe chain. Al Ruwaini is also the Founder and Chairman of the Nashwa Charity Foundation. Her award winning company Pyramedia is renowned in the Middle East for having produced several significant and popular television shows that have been aired across the region and recognized for their success. Of these shows the most viewed was The Millions Poet and Prince of Poets, as well as the Morning Show, the Evening Show and the newly released talent show Al Zaman Al Jameel. Nashwa Al Ruwaini was also the Co-Founder and Board Member of the Middle East Film Festival, Abu Dhabi which was later renamed the Abu Dhabi Film Festival. Additionally she was appointed member of the jury for the International Digital Emmy and is an appointed member of the International Academy of Television Arts and Sciences in the United States. She has also consulted for Hollywood’s famous movies such as, Kingdom of Heaven, Pirates of the Caribbean, Syriana and Aladdin.